According to a report released Tuesday, March 17, there are more homeless individuals than ever on the streets of San Joaquin County. On its face, the 106 percent increase from 2013 to 2015 is shocking. In reality, that jump is due less to a dramatic increase in local unsheltered homelessness and more to proactive and focused outreach to homeless individuals living on the margins of our communities. Furthermore, each count — including this year’s — under-report the number of homeless individuals in our county. It’s impossible to survey every person living on the streets in a county as spread out as ours, and not all homeless individuals who are contacted desire to participate. This part of the count also doesn’t include those who are staying in homeless shelters or transitional housing for the homeless. Those staying temporarily with friends and family and people who would be homeless if it weren’t for government subsidies like Section 8 and General Assistance are not included in any count. That means literally thousands of people living on the knife-edge of homelessness are not included in this survey, or any other estimation of the total homeless population. Taken in this wider context, the numbers tell an obvious story — homelessness is an ongoing, chronic issue, especially in Stockton, where 230 of the people in the January 2015 count live. But the question remains: What to do about it? Homeless service providers have worked diligently for years to help people get off the streets, into both temporary and permanent housing, and into situations where they can be self-sufficient. Many local agencies and charities operate successful programs that help hundreds, sometimes thousands, of people each year. But there aren’t enough resources to meet the need, as the point-in-time counts clearly show. The most critical of these resources is affordable housing. While the conditions that cause homelessness are myriad — mental illness, substance abuse, lack of education, lack of life skills, lack of economic opportunity, poor decisions, poor fortune — the lack of truly affordable housing must be considered the largest. Many who wind up homeless have an income of some type, but they operate on the barest of budgets. According to the latest numbers available from various government websites, a disabled individual receiving Supplemental Social Security could expect $890 a month; a single mother of two young children relying on welfare could expect $684 a month, plus food stamps. For their housing to be affordable according to federal guidelines, the first household should spend no more than $267 monthly on rent and utilities; the second household $205. Housing at that price point is virtually impossible to find in Stockton. Yet, it’s wildly difficult to overcome the obstacles between homelessness and self-sufficiency without a home base. Mental health, substance abuse, education, and life skill issues are all easier to address if an individual has a safe, stable place to call home. Not even the most well-constructed program will be 100 percent effective, and housing alone isn’t the answer. But it’s a vital part of the solution, and so is acquiring the resources to make it happen. If Stockton’s elected leaders and creative minds are serious about addressing homelessness, finding ways to increase housing opportunities for those at the bottom of the income scale is the logical place to direct their energy. I believe it is worth the effort, even if on the surface it appears finding more resources will be difficult. 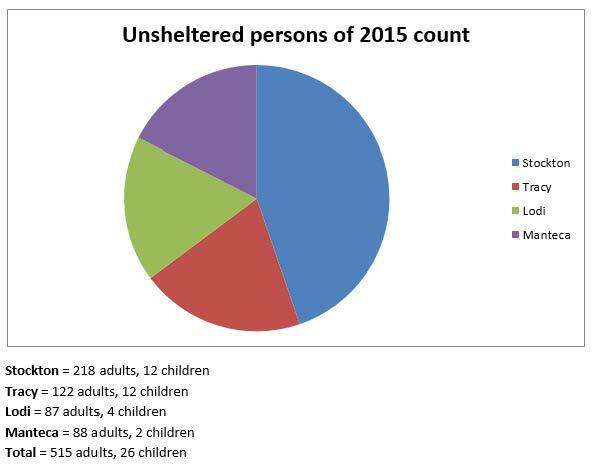 Because the 2015 unsheltered count isn’t about statistics. It’s about making visible 541 people who are mostly invisible — 541 people with emotions, hopes, and stories who lived on the streets during the coldest time of the year, and who deserve a chance to change their lives. Well, unfortunately the “New Poor” are the result of the reckless policies of this presidential administration and these trends are national. It’s not just the lack of full time jobs being available and the fact that the current average American annual income has plummeted to 1979 levels, but for the first time ever, and reported by Social Services, retirees are now outliving their retirement benefits and pensions, making them the New Poor; and these are former White Collar Workers, bank executives, business people, etc. Under the current presidential administration the Middle Class has been annihilated pushing many of those foreclosure victims into the pool of the New Poor. It has been determined that under Obama poverty in America is now at a 50-year record since before the LBJ Great Society movement and war on poverty; and food stamp recipients have skyrocketed to over 50 million Americans (by comparison during the Bush Years there were only about 27 million Americans on food stamps). In my neck of the woods (Long Beach, CA) I see an ever increasing amount of homeless on the streets, but these are not the dregs of society, drug addicts or alcoholics as normally thought of the homeless. Instead, these are people that look like your next door neighbor, grandparents, young healthy people, and many of them are not of the ethnic groups or illegal aliens. Obama talks about ‘helping’ the Middle Class, while it was actually his questionable policies that have intentionally obliterated it. A nation cannot tax its way into prosperity, yet this is exactly what this presidency has attempted to do with complete failure generating poverty levels never before seen, and this is why Forbes Magazine labeled Obama “The Biggest Government Spender In World History”… Obama added to the national debt approximately $8 TRILLION in a measly 3.5 years flat (2009 – 2013) with literally nothing to show for it but a grand total debt of $17.2 TRILLION, and which doubled the national debt since George Washington through 236 years of the previous 43 presidencies combined, including the cost of GW Bush’s 2 wars (Bush Jr. increased the national debt by an additional $5.2 trillion over 8 years, so this pales in comparison to the damage done by Obama). So the finger of blame can be pointed to the person currently sitting in the lavish and opulent Oval Office, as far as I can accurately determine.